Create an instant free standing grid wall display with our Black Standing Grid Screens. Our grid screens are a smart way to merchandise your product. By adding shelving or any other grid wall fixtures this unit can be instantly transformed to display clothing, books, jewelry or just about any other type of retail merchandise. 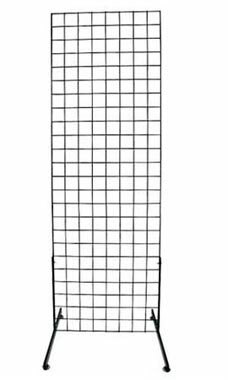 The grid screen includes 1-2 x 6 grid panel and 1 set of grid legs. Check out our article on how to set up a Grid Screen Wrap Station in the Customer Connection section of our website!